Arthritis literally means “inflamed joint.” Normally a joint consists of two smooth, cartilagecovered bone surfaces that fit together as a matched set and that move smoothly against one other. Arthritis results when these smooth surfaces become irregular and don’t fit together well anymore and essentially “wear out.” Arthritis can affect any joint in the body, but it is most noticeable when it affects the hands and fingers. Each hand has 19 bones, plus 8 small bones and the two forearm bones that form the wrist. Arthritis of the hand can be both painful and disabling. The most common forms of arthritis in the hand are osteoarthritis, posttraumatic arthritis (after an injury), and rheumatoid arthritis. Other causes of arthritis of the hand are infection, gout, and psoriasis. Signs and symptoms of arthritis of the hand Stiffness, swelling, and pain are symptoms common to all forms of arthritis in the hand. 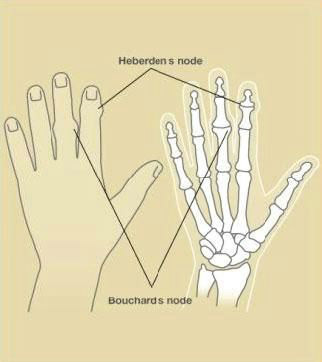 With osteoarthritis, bony nodules may develop at the middle, or PIP, joint of the finger (Bouchard’s nodes), and at the endjoints, or DIP, of the finger (Heberden’s nodes) (see Figure 2). 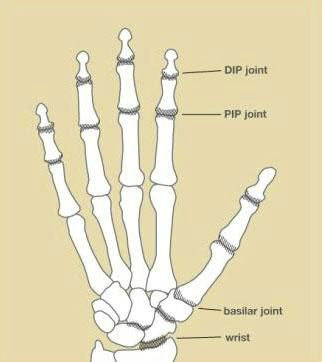 A deep, aching pain at the base of the thumb is typical of osteoarthritis of the basilar joint. Swelling and a bump at the base of the thumb where it joins the wrist may also be observed. Grip and pinch strength may be diminished, causing difficulty with activities such as opening jars or turning keys. Pain, swelling, stiffness, and diminished strength are also seen with osteoarthritis of the wrist. How is osteoarthritis diagnosed? Your doctor will examine you and determine whether you have similar symptoms in other joints and assess the impact of the arthritis on your life and activities. The clinical appearance of the hands and fingers helps to diagnose the type of arthritis. Xrays will also show certain characteristics of osteoarthritis, such as narrowing of the joint space, the formation of bony outgrowths (osteophytes or “nodes”), and the development of dense, hard areas of bone along the joint margins. Treatment for osteoarthritis of the hand Treatment is designed to relieve pain and restore function. Antiinflammatory or other analgesic medication may be of benefit in relieving pain. Brief periods of rest may help if the arthritis has flared up. You may also be advised to wear finger or wrist splints at night and for selected activities. Often soft sleeves may be of some benefit when the rigid splints are too restrictive, especially when the arthritis is affecting the joint at the base of your thumb. Heat modalities in the form of warm wax or paraffin baths might help, and when severe swelling is present, cold modalities may be of help. It is important to maintain motion in the fingers and use the hand as productively as possible. Hand therapy is often helpful with these exercises, splints, and modalities. A cortisone injection can often provide relief of symptoms, but does not cure the arthritis. Surgery is usually not advised unless these more conservative treatments fail. Surgery is indicated when the patient either has too much pain or too little function. In most cases, the patient knows best and actually tells the doctor when it is time for surgery. The goal is to restore as much function as possible and to eliminate the pain or reduce it to a tolerable level. One type of surgery is joint fusion, in which the arthritic surface is removed and the bones on each side of the joint are fused together, eliminating motion from the problem joint. Joint fusion may be used to relieve pain and correct deformities that interfere with functioning. Another approach is joint reconstruction, in which the degenerated joint surface is removed in order to eliminate the rough, irregular bonetobone contact that causes pain and restricts motion. Once the degenerated portion of the joint surface is removed, it may be replaced with rolledup soft tissue, such as a tendon, or with a joint replacement implant. Which type of surgery is used depends on the particular joint(s) involved, your activities, and your own needs. Your hand surgeon can help you decide which type of surgery is the most appropriate for you.